Based on years of experience with SAP improvement projects in the Procure to Pay (P2P) process, Avelon has established a number of best practices. Using our recommendations, significant improvements in the P2P process can be realized. In this blog we will discuss the do's and don'ts. They are summarized below, afterwards we go deeper into the details in the following sections. Faster invoice processing, higher percentage of on-time payments and payment discounts. Goal: Reduce number of non-PO invoices. 2-way match with agreement on delivery with invoice approval for other (indirect) purchase. Use SAP investment and avoid indirect license risk. A major drawback of processing invoices which are not related to a purchase order (non-PO invoices) is that the financial classification elements such as cost center, cost type and such are often unknown to the Accounts Payable Administration. This makes it difficult to realize direct routing to the correct approver. Approval of non-PO invoices is always necessary. The missing information regularly ends in the endless internal sending of the invoice. In addition to the absence of relevant classification elements, the lack of insight into obligations is a major disadvantage of accepting invoices without a purchase order reference. Enough reasons to aim for reducing the percentage of non-PO invoices. The acceptance of the use of POs can only be successful in an efficient and user-friendly process. Submitting purchase requisitions and approving them must be simple and user-friendly. Registering and controlling the purchasing process is crucial in order to come to spendings that comply with internal and external rules (compliancy) before the inevitable invoice arrives. In addition, orders ensure simple matching of the invoice and thus less errors in accounting, shorter turnaround times and faster payment terms. Registering orders for services and consumables also provides the Budget holder with a better and more up-to-date insight into the available budget. Registering the (indirect) procurement needs is a problem for many organizations. The employees who are charged with this do not see this as the primary task and input is complex and time-consuming. 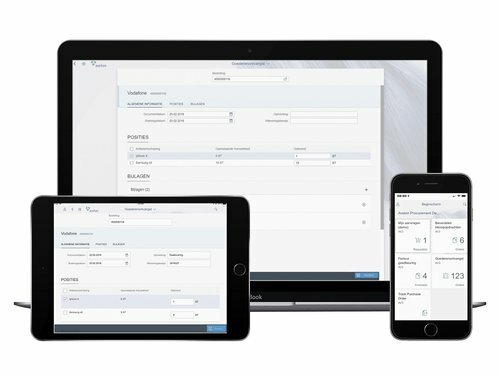 The Avelon Purchase Order Fiori app makes registration of (indirect) orders child-friendly and place and time independent. This lowers the threshold to register and is therefore the perfect start to your excellent ordering process. Compatible with SAP ERP and S / 4HANA. Read more about the Avelon Purchase Order app here. In addition to the creation of purchase orders, it is also possible to approve orders for which a release strategy applies via a Fiori app. 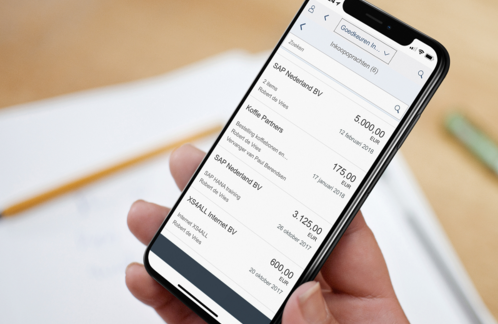 The Avelon Purchase Order Approval Fiori app makes handling the order for the budget holder easy and accessible. The app consists of the standard SAP Purchase Order approval app, which immediately shows how many tasks are still open to the budget holder. The app has been expanded in a number of areas. The app has been translated into Dutch and the insight into the entire treatment history has been added. Finally, it is possible to show a print preview of the purchase order confirmation so that the budget holder can see exactly which order is sent to the supplier. The app can not only be used in the workplace, but wherever there is an internet connection, on every mobile device. Not only is handling easy, but convenience is also served! Depending on your internal security policy, additional measures are required for mobile use. Read more about the Avelon Purchase Order Approval app here. Processing a goods receipt within SAP is no sinecure, certainly not if this has to be done in the context of the 3-way match by someone who does not work on a regular basis in SAP. The Avelon Goods Receipt App makes the capture of the goods receipt much easier and also mobile. An important part of the app is the Smart Search functionality as applied to the Avelon Purchase Order App. This makes it much easier to search for the right order where reception is to be booked. You can search by order number, supplier name or product description. Read more about the Avelon Goods Receipt app here. The goal is to achieve "touchless" invoice processing through creditor administration. Touchless invoice processing means that creditors administration does not have to perform any manual actions to record the invoice in the SAP system. The system determines what the possible follow-up actions are. These can vary from automatically routing the invoice to the responsible(s) if there are price or quantity differences between invoice, order and goods receipt. With a so-called 3-way match, the invoice can be automatically made payable. With non-PO invoices, the invoice must be approved at all times. Several Avelon customers switched from OCR processing in-house to E-invoicing. An end-to-end e-invoicing solution replaces the current OCR process by "outsourcing" this functionality to an external service provider. This service provider transforms received XML or PDF invoices into a uniform and consistent format. This allows invoices to be automatically imported into the SAP system and the current processing procedures are started. Invoice data of the PDF invoices are automatically recognized, just like the OCR process, with a guaranteed, significantly higher recognition rate compared to the OCR process. Increase quality recognition and accounting. Avelon has developed an end-to-end solution in collaboration with Invoicesharing to drastically improve invoice receipt, recognition and processing in SAP. The solution is aimed at receiving and processing centrally and then automatically read in SAP from all your digital invoices. These are both the PDF invoices and the e-invoices (XML). You can scan any paper invoices yourself with a simple scanner and then send them to the platform. This means that your entire invoice flow is processed uniformly. Read more about Avelon E-invoicing here. With SAP Fiori, SAP has been able to offer a prize-winning user experience for several years. Thanks to this user-friendly front-end, so-called business users can also be involved in previously difficult to understand SAP transactions. By offering a harmonized user experience in the relevant steps of the process for business users, they can be directly involved in the process. Previously, sub-administrations were often carried out by support services. Due to the deployment of Fiori, these are no longer necessary and security and authorizations are enforced and adjusted within one environment. In addition, high fines are prevented by non-compliance with license agreements concerning the so-called indirect use of SAP software. For questions or additional information on this subject, please contact Wouter Van Peteghem. Thanks to Sander van der Wijngaart for writing this article.